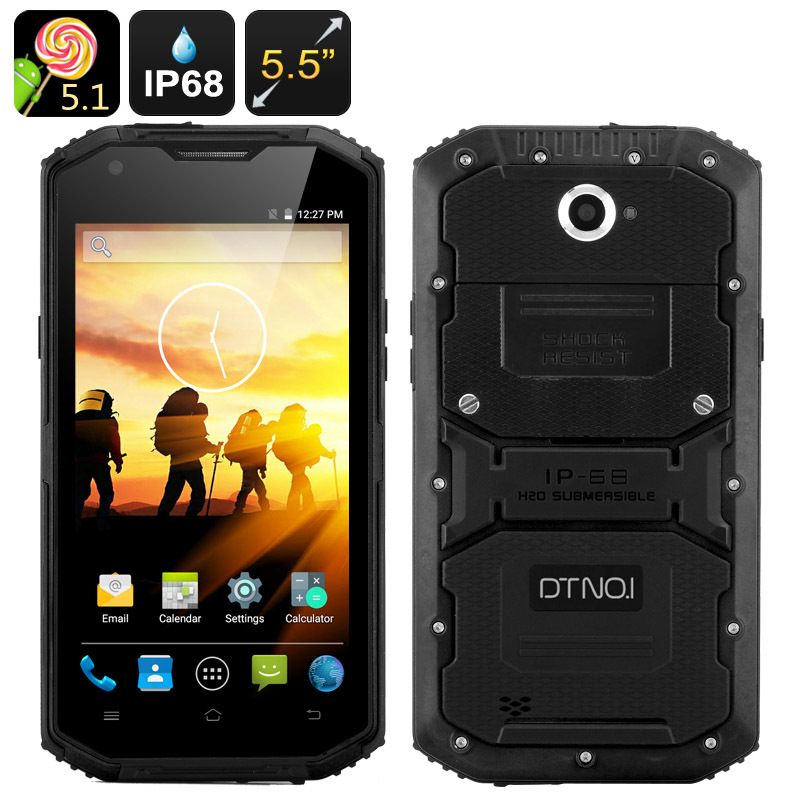 Successfully Added DTNO.1 Rugged Smartphone - Android 5.1, 5.5 Inch HD Screen, IP68, 4500mAh Battery, Two SIM, FM Radio (Black) to your Shopping Cart. The DTNO.1 Smartphone comes with a 5.5 inch HD screen, Android 5.1 operating system, IP68 waterproof rating and a powerful 4500mAh battery. The DTNO.1 is a strong rugged smartphone with extensive functionality. A solid build makes sure that the phone can handle the rough outdoors and is resistant to the elements. The IP68 rating guarantees that the phone is dust tight and can be immersed in water. The DTNO.1 also comes with a powerful LED flashlight to guide you after sunset and an SOS button for emergency situations. With a large 4500mAh battery, you will have up to 10 hours of continuous talk time and over 150 hours on standby. The rugged phone covers a wide range of networks: 2G (GSM 850/900/1800/1900MHz), 3G (WCDMA 850/900/1900/2100MHz) and 4G (FDD 800/1800/2100/2600MHz) — all of that on two simultaneously supported SIM cards. A large 5.5 inch screen will give you a great media experience and Android 5.1 operating system offers an easy-to-use interface and access to the Play Store. With Bluetooth 4.0, you also have smooth and stable connectivity with other devices. With two cameras, 5MP front and 13MP back, you will always be able to snap nice landscape photos or take a quick slefie or two. You will have 16GB of internal storage space at your disposal + up to 64GB externally. The DTNO.1 Smartphone comes with a 12 months warranty, brought to you by the leader in electronic devices as well as wholesale Android Phones..